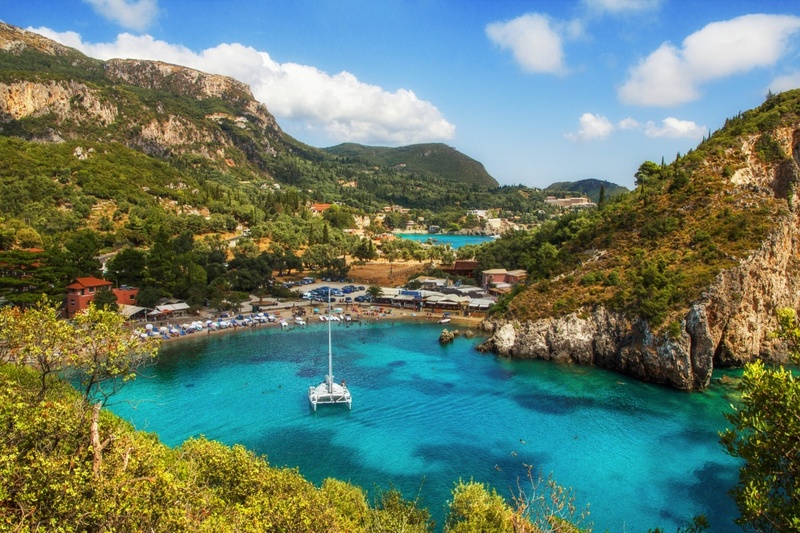 Paleokastritsa is undoubtedly one of the most recognizable areas of Corfu standing out with its crystal waters, a rocky coast and bays without sand. The beauty of the landscape leaves no one untouched. The green of pines and beaches with golden sands enchants every visitor. The area consists of 6 smaller bays with the main beaches located beneath a monastery and near the harbor. The Paleokastritsa area is just 25 km away from the city center and consists of two peninsulas and six small bays. The landscape remains unchanged through time while the tourism infrastructure doesn't disturb the nature's beauty in any way. The area was discovered by English tourist travelers. Until 1950, only the historic Monastery of Paleokastritsa stood out and a road built during the period of British rule on the island. Paleokastritsa enchants with cold and crystal clear waters while the main beach provides all amenities to visitors. But if you belong to those who prefer to avoid the crowds, you'll also find smaller bays for swimming such as Alypa, Agia Triada, Agios Petros, Ambelaki and Platakia, that will reward you without a doubt. Having become one of the most famous holiday spots on the island, Paleokastritsa is characterized by tourist facilities and seasonal residences that pop up between the green without altering the character of the island. Visitors here have the opportunity to relax and enjoy the pleasures of the sea in the main bay or smaller coves. In recent years, particular attention has been given to alternative and thematic tourism which has become a powerful incentive to intensify the traffic to the island. Besides enjoying the beaches and waters, you shouldn't miss to visit the famous historic monastery of Panagia Palaiokastritissa with Byzantine icons kept in the sacristy, founded in 1225. The monastery is built on a cliff, overlooking the breathtaking landscape, astonishing even the most discerning guest. The monastery also faces the islands of Ortholithos, Kolovri and Skeloudi and while also many tourists visit Angelokastro, a stunning location in the Corfiot countryside. Find information about selected Hotels, apartments and rooms in Palaiokastritsa to choose the perfect place for your accommodation.